Renowned equine artist Peter Williams has died at the age of 84 after battling the effects of Lyme disease and advancing dementia. New Zealand-born Williams died at his home in Goshen, Kentucky, in the US on August 13. 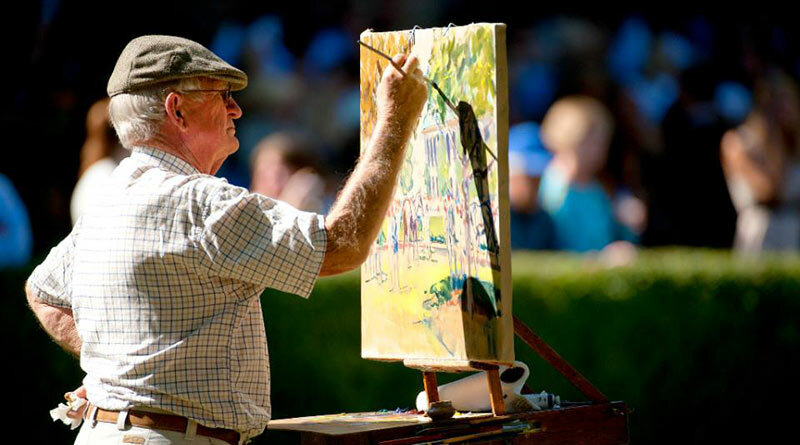 Williams captured the atmosphere of the racetrack with his pre-race scenes and became a fixture and the “unofficial artist in residence” in the paddock at Keeneland, Churchill Downs and Saratoga. He painted at racetracks around the world. Every year during the Kentucky Derby, watched by more than 14 million people, television covered his progress on a painting over a day. New Zealand equestrian artist Peter Williams has died in the US at the age of 84. Born in Ruatoria on the east coast of New Zealand’s North Island, Williams grew up on a sheep station near Gisborne. By his own admission, with a few notable exceptions, aspiring artists in New Zealand in the early 1950s had two options, teach or starve. So painting became a pastime for Williams while he worked as a shepherd and continued to be an important part of his life when he had a small property of his own farming sheep and cattle. He was encouraged in his art, which, because of his talent, led to emerging recognition, winning awards and landing exhibits in New Zealand and Australia. Williams won several awards for his work, and was invited as a guest the inaugural 747 flight of Qantas Airlines to the US in 1971. He returned to the US in 1981 with his family, and all three children attended art school and painted scenes from life alongside their artist father. A chance meeting with well-known equine artist Richard Stone Reeves resulted in a commission to paint racing scenes. Williams spent more time in the United States, visiting racetracks and equine sporting venues while building a vast international network of friends and collectors. His collaboration with Reeves lasted for five years. More well-known in the US than in his homeland, Williams spent half of each year in the northern hemisphere, and said he hadn’t seen a winter in 30 years. Williams realized that seeing someone painting from life was a novelty and a fun distraction for many attending racing and sporting events. A unique combination of talent, his outgoing nature and self-deprecating sense of humor were irresistible. He was in demand and Kentucky became a second home for him, largely because of the welcoming atmosphere at Keeneland and Churchill Downs. Despite his abiding fondness for capturing the beauty, personalities and excitement of racing and equine sport, he went on to paint a wide variety of subjects. Vintage automobiles, flower gardens, architecture, marine subjects, landscapes, figure studies and special events, always from life and almost always executed in oil, take shape quickly on his canvas. Williams was commissioned by royalty, art collectors, and equine organizations around the world. He was twice invited by Queen Elizabeth II to paint the Sandringham Estate Carriage Trials. In 2012 Williams hosted a retrospective exhibit in New Zealand for the launch of his book Peter Williams Retrospective: Paintings and People Dear to Me. Despite being well known as an artist, when introductions were made, he often quipped that he was an unemployed sheepherder from New Zealand. Peter Williams is survived by his best friend, Lee Anne Fahey; sons Harold and Tom, and daughter Belinda Pridham, as well as six grandchildren. A celebration of Williams’ life and career will take place at the “Peter Williams: Painted from Life” exhibition on September 7 at the Headley-Whitney museum in Lexington. So,so sorry to hear of Peters passing, we send our sincerest sympathy to all his family and to LeeAnne, he always kept in touch especially at Chirstmas time, when we didn’t last Xmas we guessed he cannot have been well,he told us of his contracting the Lyme disease earlier. We are fortunate to have several of Peters paintings, mainly done at Braemar station,in the mAckenzie country , nz where he stayed with us over many years, particularly during autumn to catch the stunning colours. He also stayed with us at Moreaki by the sea near Oamaru, and at our retirement home in TIMARU. We were fortunate to meet Lee Anne here too, do you remember painting lilies here in our studio? Always fun and loved talking farming and travel tales and wonderful experiences with people. Such an entertaining and special gentleman, an honor to have known and spent time with him. Our loving thoughts are with you all.he will be sadly missed.